Call to order by the Chairman and Pledge of Allegiance to the Flag of the United States. Rae Hollenbeck, MCSD Director of Food and Nutritional Services, described a new technology called Biometric Finger Imaging that has only been available about six months. She showed a PowerPoint presentation. Finger images are scanned and stored on the computer network, so that children no longer need cards. Rae explained how children forget and lose cards as they run off to school in the morning. This backs up the lunch line and creates managerial time reprinting meal cards. Rae commented that already this school year 4,000 meal cards had been reprinted just at the middle schools. The cards become unsanitary, because the children put them in their mouths. 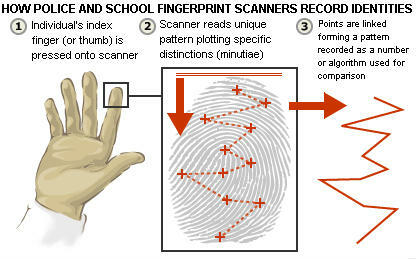 To solve these problems, schools are using biometric scanners in the cafeteria. The student places their index finger on a scanner. The Perfectmatch software extracts the small marks on their finger tip and creates a template. These marks are transformed into a binary number that is encrypted from the time it is captured to the time it is stored on the database, and the finger image is discarded. The binary number will become the student ID number. Only the numbers are retained and it is impossible to recreate a fingerprint image from this data. This is a closed system, and it is not accessible from the internet. The biometric images cannot be used by law enforcement for identification purposes. Only a mathematical algorithm remains in the system after registration, not finger images. 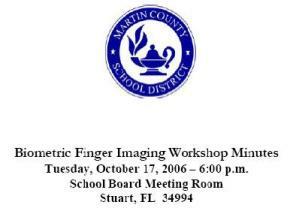 Rae stated that she would like to pilot this program at Murray Middle School in January 2007. The program would not be mandatory. Parental choice would be offered if parents wanted to opt out of the program. The hardware would run somewhere around $200 per line. The total cost of hardware and software would run about $1500.00 per cafeteria. The new technology would improve sanitation of the line, increase the speed of the serving lines, and reduce staff time dealing with missing and lost cards, forgotten ID numbers, and reprinting cards. No one from the public requested to speak. Tuesday, October 17, 2006 â€“ 6:00 p.m.
Lorie Shekailo suggested withholding â€œOpen to the Boardâ€ and doing it at the Regular Board meeting which followed. There being no further business to bring before the Board, the meeting was adjourned at 6:24 p.m. The sanitation argument is new to me. Imagine – stressing the sanitation benefits of having every child in a middle school put his germy little finger on the same sensor as every other child… Seems like a good way to isolate viruses, doesn't it? A lot better than giving each child a paper card! The idea of children putting their cards in their mouths sends chills down my spine. In contrast, they would never stick their fingers in their mouths, and then swipe them on the finger print reader for distribution to all the other kids. Talk about a shared secret! The biometric images cannot be used by law enforcement for identification purposes. Only a mathematical algorithm remains in the system after registration, not finger images. If you want to find out who owns a fingerprint, just convert the fingerprint to a template and do a search for the template in one of these databases. Call the template a binary number if you want to. The point is that all you need to save in the database is the number. Later, when you come across a “fingerprint of interest”, you just convert it to a number and search for it. Law enforcement can use this information – and so can criminals. It drives me nuts that people can just open their mouths and say anything they want about biometrics and other technical matters without any regard for the facts. There should really be fines for this type of thing – rather like we have for people who pretend they're a brain surgeon and then cut peoples’ heads open. LeaveThemKidsAlone has an annotated commentary here. And if you haven't see it yet, don't miss this little movie clip. It will boggle your mind.